It's getting cold outside and my ghetto $20 Old Navy puffy jacket looks, well,... ghetto. Mama needs to upgrade to a big girl coat. 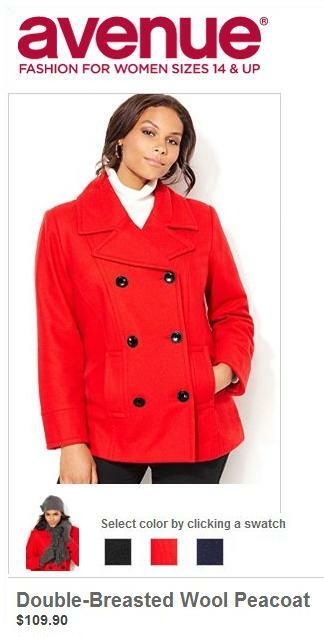 No seriously, a BIG girl coat - I'm shopping the plus size section. GASP. It's fairly easy to find a jacket in 'regular' size and tall length. It's fairly easy to find a jacket in plus size and 'regular' length. But Oh. Em. Jeepers it is nearly impossible to find a plus size/tall length coat that will fit my 6' tall frame with banging curves like these. WHY? What is the hold up!? It's not a huge logical step. Would someone please fill Motherhood Maternity in on this idea as well? Why they don't make tall maternity jeans in... fluffy sizes is beyond me. Here are my top picks of plus-size-jackets-that-might-have-long-enough-arms. Vote for these or leave a link to a jacket you think is along these lines but BETTER. Thanks for the assistance! Not a huge fan of the color choices, but Navy might be alright. $110 isn't a bad price. This seems like it would look slightly less boxy because of the button placement. It comes in Navy but is $130. Fabulous jacket. I trust Land's End quality, but you sure do pay for it. $165 but it comes in a lot of great colors and this Pink Begonia option is too cute! While this looks like a shorter, cheaper version of Option C, it's also a fleece jacket, not wool. hrmmm.. This was the first jacket I found, and I really love all the details (The big lapels, the nice roomy pockets, the cinch at the wrist, the details on the back, however I hate the $180 price tag - especially when I could buy the Lands End jacket for less and have money left over to go towards a cute scarf. This jacket is SOO cute. A little uppity with the medallion, but I love the flared arms, the pleats at the waist and the nice big hoodlike lapel at the neck. It's very dramatic, but I'm not sure it would blend with my more casual wardrobe. I do appreciate it for fancy outfits though. $150. I love that this is a simple coat with 1 girly detail, however I don't think the ivory is a smart color choice with a toddler. $130. Which do you think I should buy? I find it funny you can't find plus size in taller cuts, and I can't find plus size in shorter cuts! Ha ha! My vote goes to option F! Option E. I really love the Lane Bryant one. It would look great on you and is very classic. You could wear it for years. Lane Bryant also has free shipping to their store and you can return items your buy online to your local store! (Can you tell I shop Lane Bryant a lot?) Good luck!! :) Let us know what you decide! I love the last three. I like the charcoal at onestop because I feel like it would be most versitle looking pretty yet casual/ or looking great with dressier outfits. Love the cream- but couldn't imagine keeping that clean- let alone with a little one. Huge fan of dark purples this year- very on trend color. Top vote for charcoal onestop. E is probably the most practical alround. F is a great colour and a little more unique in style. G is just plain cute! Option H is my favorite! It's beautiful! 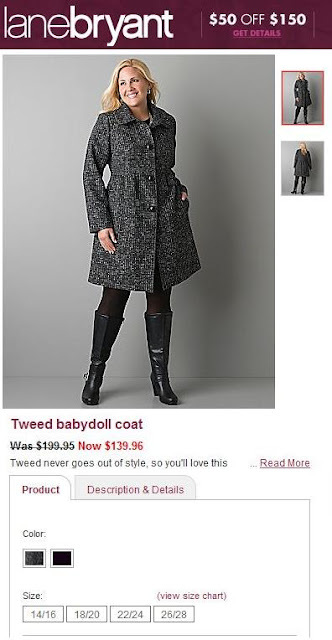 the Tweed Baby Doll Coat....I did like the Ivory one the best though. Agree with you, I could never wear a Ivory coat with my twin babies and a 5 yr old's sticky hands. Carla, do you ever go to Retailmenot.com for discount codes or google the store name plus "discount code"? I'm obsessed with doing that and I've saved a lot of $$! E or G, they would look really nice and compliment your small waist. Plus grey goes with EVERYTHING- black, white, colour. And the prices for those are pretty good. Let us know what you decide! Land's End wool. The quality can't be beat. G and H are SUPER cute, BUT do you want to put up with an Ivory coat? That's the only downfall I can see. I have a long black version of the Avenue one.. and it is amazing! I look great in it!